Branching narrative – Real? Wanted? Possible? 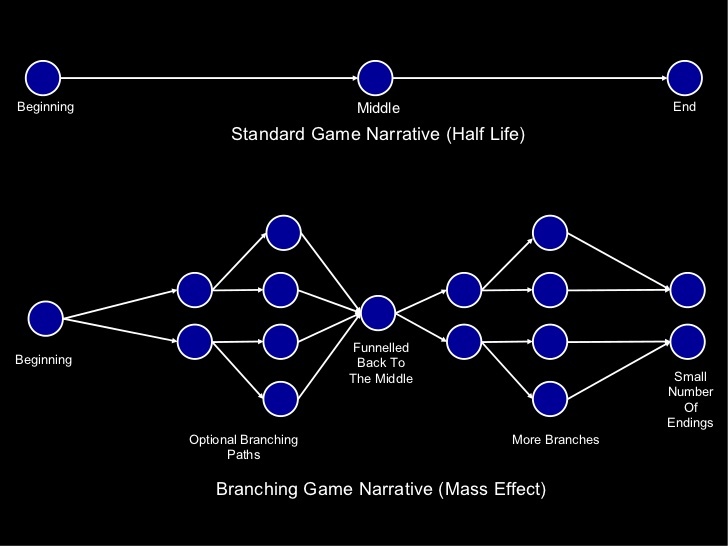 As part of my day at AdventureX the other day, I attended (and contributed a little) to a panel on branching narrative. 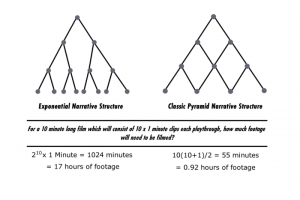 There was a lot of interesting discussion, with a lot of reference to commonly cited examples of ‘branching narrative/storyline’ such as Heavy Rain, The recent series from Telltale Games (The Walking Dead, Wolf Among Us etc.) and it got me thinking…. Do these games actually use branching story line at all? To answer that we have to first ask: What is ‘branching story line’? In my mind, that’s when there are choices within a narrative/story and the results of those choices have SIGNIFICANT effects on what happens further on in the game. Now, I don’t feel it has to be exactly like the diagram above in order to be branching. It may be sensible or appropriate sometimes to allow the player to jump between branches. Even if that does happen, the player has had a significant effect on the outcome of the narrative. So what’s my problem with the examples named above, seeing as everyone is raving about them being at the forefront of ‘branching narrative’? Last year, I attended the Annual BAFTA Games Lecture with David Cage (you can listen to the audio here) and even he admitted that Fahrenheit, Heavy Rain and Beyond: 2 Souls didn’t use branching narrative. He used the idea of ‘bendy or elastic stories’. There is a shape that stories naturally are, but sometimes you allow the player to stretch it in one way or another a little before it snaps back to its original shape. Stretch it too far and it breaks. So whilst you can momentarily distort the story, you can’t really change it. It was refreshing to hear this from Monsieur Cage because I’d had the veil unceremoniously torn from my eyes whilst playing Fahrenheit several years ago. Upon completing the game and watching the end credits I saw some scenes/events that I hadn’t seen in my game. So I started a new game, thinking, “How will the game turn out if I choose something different to what I chose the first time round?” The answer was more or less nothing. Very little that I did or said made any difference to the game flow. Nothing changed for Heavy Rain (hence the encouragement to only play once!). As for Telltale, I haven’t replayed significant portions of it yet, but it’s clear that the same kind of smoke and mirrors is going on. In The Walking Dead, your choice of who to save makes precious little different to the events that come after it. It may change a few lines of dialogue, if that. The only reason people think they’ve got some kind of agency is because the game lies to you (“Clementine will remember that…” etc.). It lies very well and with style, but it still lies. The only real results of your actions are that 5/6 of them are recorded to compare with what other games players ‘chose’ when faced with the same decision at the end of the episode. 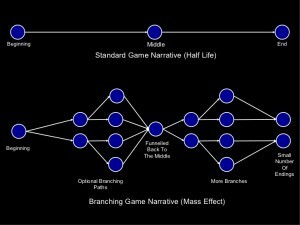 Since branching narrative means you can make choices and have a significant effect on the game world and how the story plays out, and since you really can’t in these examples (which are often touted as solid examples of branching narrative), I think we need to stop holding them up as models for this particular idea. So, do any games have branching narrative? Maybe, but they’re often confined to the worlds of text-heavy games such as old-school RPGs and text adventure type games. During the panel, a point was made that if the player thinks that they are making significant choices, then that’s all that matters. I disagree. Due to the fact that it’s all based upon a reasonably candid lie, I think that any consumer/player with an element of critical faculties will be able to see through this fairly basic smokescreen. When that happens, the game loses a kind of authenticity – analogous to when we realise that the new drink we’ve just purchased at the bar might still taste nice, but it doesn’t make us more attractive or stylish. So no, it does matter whether the branching is real or not, and it isn’t enough to just create the illusion and hope that no-one never notices. 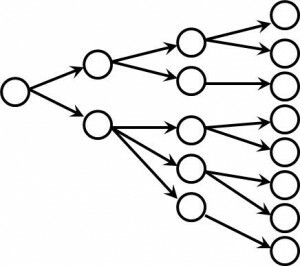 Do we need branching? Do we want it? Is it desirable? I think so. Greater agency promotes greater involvement and deeper engagement with the systems and story of the game. The problem with branching as illustrated above is that the story tree beings to look like the fractal picture. Not only is this difficult to handle in terms of narrative integrity, but the assets and (wo)man hours involved in producing this would be immense, especially since not all players would access that content. But does branching narrative have to look like that: an exponentially bifurcating tree diagram? 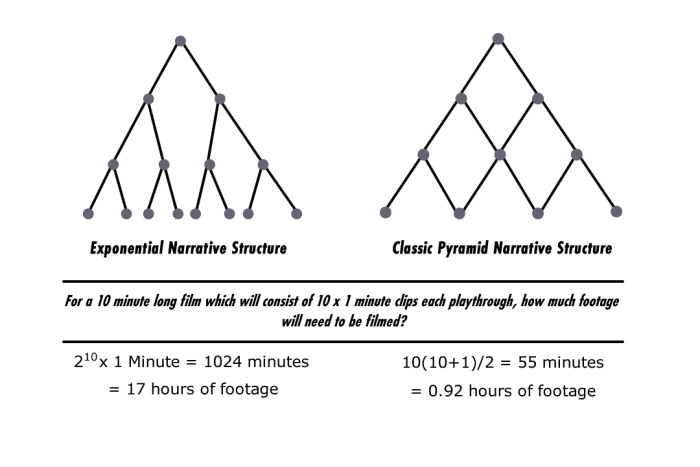 This diagram from the blog of film student Sean Wilkinson makes a useful suggestion. In this context Sean is pondering how to make a 10 minute film that could be made up of 1 minute segments, and yet give the viewer some choice in what they see. This is more or less the same as David Cage’s ‘elastic stories’ idea that I spoke about above. Another recent idea (spoken about in the slideshow referred above) is to build emergent systems which give rise to ad hoc stories that arise from the interplay of systems and mechanics in a game rather than traditional methods such as characterisation, dialogue and cut-scenes. I don’t think we’ve really exhausted the possibilities of predetermined narrative structures quite yet. The ‘Classic Pyramid Narrative Structure’ illustrated above provides more agency and more individuation for each player, without a corresponding increasing pressure to create resources. So why hasn’t this been adopted by anyone? Maybe it has, but I can’t think of any well-known examples. Furthermore, what about a web of narrative? Imagine that there was just a conceptual grid of interconnected narrative units that the player navigated, choosing which ones to view/play. Later on, the mind of the player would put it back together in their own special way, using their own interpretations born of their life’s experience and the units they happened to play. Maybe there could even be different entry and exit points, depending on choices made? That may not be branching narrative, but it does give control over to the player to choose which bits of narrative they engage with, and create the potential for a myriad of interpretations and engagement. For certain, it’s non-linear, and isn’t that really what branching narrative was trying to solve and overcome – the predictability of linear narrative? Wow, thanks for the summary! I missed the panels because I wanted to see the demos 🙁 But this is interesting! deWhen someone writes an piece of writing he/she retains the thought ofa user in his/her mind that how a user can know it.So that’s why this post is great. Thanks! Scary stuff. With interest rates sitting at 9% and most likely set to increase in the near future, would it be better to take a loan to buy a R2m home or save for the next 5 to 6 years and buy it cash for R2.9m? Of course, one would have to factor in the cost of renting for 6 years. Any suggestions?